On Monday 6 May 2019 from 19h00 to 21h00. Les Points Libres ont lieu à la Maison des Adolescents de l’Hérault, le premier lundi de chaque mois, de 19h00 à 21h00. Entrée libre et gratuite sur inscription. 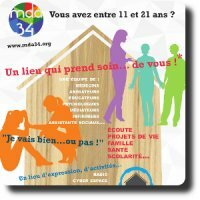 Une simple adhésion à l’association est possible et auprès de la MDA34. Cet événement vous est proposé par le partenariat qui lie la Maison des Adolescents de l’Hérault et Montpel’libre. Notre bibliothèque de livres, documents, revues... GNU/Linux, systèmes et logiciels libres est disponible à la consultation dans la salle des partenaires, au premier étage. On Monday 3 June 2019 from 19h00 to 21h00. On Monday 1 April 2019 from 19h00 to 21h00. On Monday 4 March 2019 from 19h00 to 21h00. On Monday 4 February 2019 from 19h00 to 21h00. On Monday 7 January 2019 from 19h00 to 21h00. On Monday 3 December 2018 from 19h00 to 21h00. On Monday 5 November 2018 from 19h00 to 21h00. On Monday 1 October 2018 from 19h00 to 21h00. On Monday 3 September 2018 from 19h00 to 21h00. On Monday 4 June 2018 from 19h00 to 21h00. On Monday 7 May 2018 from 19h00 to 21h00. On Monday 2 April 2018 from 19h00 to 21h00. On Monday 5 March 2018 from 19h00 to 21h00. On Monday 5 February 2018 from 19h00 to 21h00. On Monday 1 January 2018 from 19h00 to 21h00. On Monday 4 December 2017 from 19h00 to 21h00. On Monday 6 November 2017 from 19h00 to 21h00. On Monday 2 October 2017 from 19h00 to 21h00. On Monday 4 September 2017 from 19h00 to 21h00. On Monday 5 June 2017 from 19h00 to 21h00. On Monday 1 May 2017 from 19h00 to 21h00. On Monday 3 April 2017 from 19h00 to 21h00. On Monday 6 March 2017 from 19h00 to 21h00. On Monday 6 February 2017 from 19h00 to 21h00. On Monday 2 January 2017 from 19h00 to 21h00. On Monday 5 December 2016 from 19h00 to 21h00. On Monday 7 November 2016 from 19h00 to 21h00. On Monday 3 October 2016 from 19h00 to 21h00. On Monday 6 June 2016 from 19h00 to 21h00. On Monday 2 May 2016 from 19h00 to 21h00. On Monday 4 April 2016 from 19h00 to 21h00. On Monday 7 March 2016 from 19h00 to 21h00. On Monday 1 February 2016 from 19h00 to 21h00. On Monday 4 January 2016 from 19h00 to 21h00. On Monday 14 December 2015 from 19h00 to 21h00. On Monday 2 November 2015 from 19h00 to 21h00. On Monday 5 October 2015 from 19h00 to 21h00. On Monday 7 September 2015 from 19h00 to 21h00. On Monday 1 June 2015 from 19h00 to 21h00. On Monday 4 May 2015 from 19h00 to 21h00. On Wednesday 8 April 2015 from 19h00 to 21h00. On Monday 30 March 2015 from 19h00 to 21h00. On Monday 2 March 2015 from 19h00 to 21h00. On Friday 6 November 2009 from 14h00 to 19h00. On Friday 2 October 2009 from 14h00 to 19h00. On Friday 3 July 2009 from 14h00 to 19h00. On Friday 5 June 2009 from 14h00 to 19h00. On Friday 6 February 2009 from 14h00 to 19h00.